In 2018 the Consortium for Schools Networked (CoSN) transformed the K-12 Horizon Report into The CoSN K-12 Driving Innovation Series with three reports. The reports are based on the work of over 100 educators around the globe who look at emerging technologies through three lenses: Hurdles, Accelerators, and Tech Enablers. As the co-chair of the CoSN Emerging Technologies Committee, I was selected to be part of the process. The Advisory Group engaged in several months of discourse about the major themes driving, hindering, and enabling teaching and learning innovation at schools. After each phase, final thoughts from advisory board members were distilled in surveys discerning the top five topics to feature in each publication. Currently I’m working with the Emerging Technologies Committee to expand the work of the Advisory Group around Accelerators, in particular Data-Driven Practices. The CoSN Emerging Technologies Committee felt that all five themes (see graphic) were important, but for the CoSN audience, Data-Driven Practices had the greatest relevance. Plus it has been over three years since CoSN had worked on examples in this area. 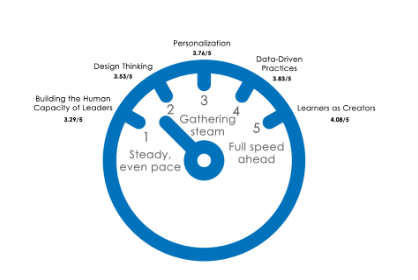 According to the Driving Innovation report, data-driven activities can be defined according to this statement: With more engagement, performance, and other kinds of data being collected, schools are leveraging that data to make decisions about curriculum, hiring, technology investments, and more. CoSN’s previous discussions on Data-Driven Practices focused on administrative issues relating to privacy, security and uses of data to inform instruction, with a major focus on compliance issues relating to No Child Left Behind. Now with the move towards student-centered learning, there’s a growing interest in looking at other ways of using data in the educational arena. The Data Fluency project at Carnegie Mellon University’s CREATE Lab is a great example of how data is now viewed as a tool for empowering both educators and student learners. Fluency is a process of deep inquiry, case-making, and advocacy. Guided by shared values, we explore how technology and data can serve as tools to enhance the voices of teachers and students. Co-powering teachers and students to be “Fluent” means they can gather information, reconcile it with their personal experience, and influence public discourse. Within this framework, the focus is on creating an individual path for exploration based on self-knowledge, in the context of the world around you. While students will have access to new tools for understanding data and creating compelling media, we believe it is the Fluency process that will lift up their voices, and mold them into critical thinkers and active citizens. In order to understand how this looks in a K-12 world I interviewed school leaders and teachers from two school districts in the Pittsburgh, PA region who are taking a lead in using data to enhance student agency – Carlynton and Allegheny Valley. The principal of Carlynton Jr/HS, Michael Loughren, introduced me to two of his English teachers who have taken the lead on the Data Fluency project – Kristen Fischer and Wendy Steiner. We don’t usually think about data projects in English. Kristen and Wendy have discovered a new approach give students a voice in their writing, oral and digital communications. For the study of Shakespeare’s Macbeth, students now analyze the character in relation to episodes of PTSD. They have to find details (data) in the form of repeated words and phrases that supports an argument that Macbeth suffered from PTSD. For another project students had choices of expression for an an oral history project on a self-selected element of family history. The students used a different tool to express themselves – a podcast format. According to Kristen and Wendy there have been a number of benefits. Student work is now always original with no elements of plagiarism. All students are engaged and see a purpose in their writing. According to Michael Loughren the Data Fluency project has deepened and strengthened relationships between teachers and students. In addition, he has witnessed a decrease in the number of discipline problems. At Allegheny Valley, Brett Slezak, the technology director, has seen similar benefits using the Data Fluency approach. Student voice has been amplified by allowing each student to make their case, which in turn has led to more student engagement. Brent emphasized the importance of using an inquiry-based processed. Students need to start by asking essential questions. At Allegheny Valley the essential question for one high school project was: What is air quality? Why is it important? Students used a SPEC sensor from the CREATE lab to monitor the air quality in multiple classrooms. The students then had to analyze the data and make their case. The problem required the students to “scrub” the data and visually represent what was happening. The students discovered patterns that led to conversations with teachers. The students had to develop a narrative so the data created a story. The students then had to advocate for changes within the classrooms. The students discovered how data revealed solutions for real world problems. There were more projects that Carlynton and Allegheny Valley teachers created. In every case students voice became amplified. Data provided a way to gain insights into real-world problems. Students discovered that data can be more than numbers. Students took their ideas to new levels by becoming agents of change advocating for solutions to solve real-world challenges. Digital Technology is seldom a stand-alone solution. It’s often a resource and if done well, a catalyst for learning. Most of my work revolves around projects and products from the Pittsburgh area, including K-12 outreach activities from Carnegie-Mellon University (CMU). For twelve years I served an an adjunct professor in the Heinz College at CMU. I tried to find ways to connect K-12 educators to learning innovations from CMU. That was the before the CREATE Lab happened. Today at CMU the CREATE Lab, the Entertainment Technology Center (ETC), and the LearnLab all provide opportunities for K-12 educators to discover new and innovative strategies, processes, and products to use in the learning environment. On July 23-25, 2018 Birdbrain Technologies, a spin-off from the CREATE Lab, will host a new conference – Catalyze Learning Summer Institute: Integrating Robotics With Your Curriculum. Registration will open in mid-February. Birdbrain Technologies is now impacting learners in over 40 countries. The conference intends to bring to Pittsburgh some of the best practitioners and practices found at global sites such as Hong Kong, Korea, Cyprus, or Dubai, as well as the United States. Key to the Birdbrain/CREATE Lab model is the focus on computational thinking and an engineering design process. The CREATE Lab calls this approach, Digital Fluency. At the conference users will have a chance not only to hear about success stories, but more importantly to experience them first-hand. Participants will have the opportunity to choose from beginner to advanced tracks in making and programming. There will be workshops on using Hummingbird Robotics Kits and Finch robots with tablets and computers for both block-based and text-based languages. Birdbrain will also provide some sneak peaks at what is in currently in development. The conference aims to create a network of users who will share their ideas at the conference and then implement their discoveries back their own sites. The conference will provide users an opportunity to immerse themselves in robotics across the curriculum and give them time to plan for their 2018-2019 school year. Catalyze Learning will be a practical, hands-on, and immersive experience that impacts not just academic learning, but changes the social landscape for learning. Due to my work with Birdbrain Technologies, a spin-off from Carnegie Mellon University’s CREATE Lab, I get to work with educators around robotics and computational thinking. In June I observed students and educators at South Fayette’s STEAM Innovation Summer Institute. In July educators from the GEMS Education schools in Dubai came to Pittsburgh to interact and join the 2nd Annual Robotics and Computational Thinking Conference hosted by Birdbrain Technologies and the CREATE Lab. Over the period of three days the educators investigated the Birdbrain tools developed at the CREATE Lab at Carnegie Mellon University – Hummingbird, Finch, and the new Flutter. The GEMS Schools has begun to develop a computational thinking framework focused on computer robotics for grades K-12. At every level teachers are designing multi-disciplinary units that include physical computing with the Birdbrain Robotics tools. At the first day’s keynote Illah Nourbakhsh, the director for the CREATE Lab, outlined the key concepts behind computational thinking – algorithmic, abstraction, and problem-solving. Illah provided concrete examples. For instance, think about dance as an algorithm. Dances are broken down into a series of steps or movements. That’s an algorithm. In today’s world it’s not just learning how to code that is critical. It’s tackling problems and coming up with creative solutions to those problems. That’s what the GEMS educators did for three days. Every educator had a chance to become a creative producer using the Birdbrain technologies. 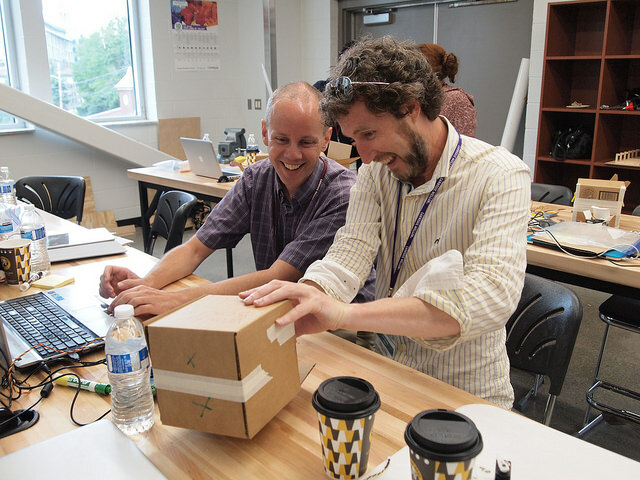 Educators worked in collaborative teams to design and create unique products that will jump-start the educators for their work in the 2017-2018 school year.